Whole Navy Beans, Whole Grain Rice, Pure Sunflower and/or Safflower Oil, Cheddar Cheese Blend [Cheddar Cheese (Pasteurized Milk, Cheese Cultures, Salt, Enzymes) Whey, Buttermilk, Annatto], Sea Salt, Tomato Powder, Onion Powder, Garlic Powder, Spices, Lactic Acid, Paprika, Citric Acid, Guar Bean Gum. Gluten free. Gluten free. Allergy Info: Made in a facility that may also use soy, dairy, seeds, wheat, corn and tree nuts. 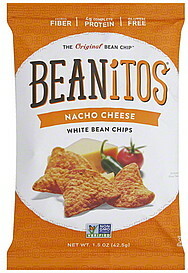 For more detailed allergy info visit: beanitos.com/FAQ. Clinically tested as low Glycemic Index by GI Labs Inc. Certified Gluten Free by the GFCO.